An alternative to rigid steel cover systems, our Pit Net Safety Covers meet OSHA recommendations & will put your business in compliance. Each Nylon Pit Safety Net includes all hardware needed for operation. Welding of steel hardware at the open pit corners is normally required. Once installed each safety cover system will typically support up to 6000 lbs. 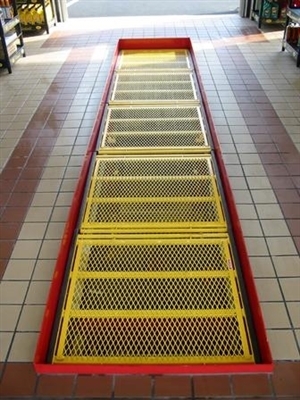 Provides safe fall protection for open automotive service pits. 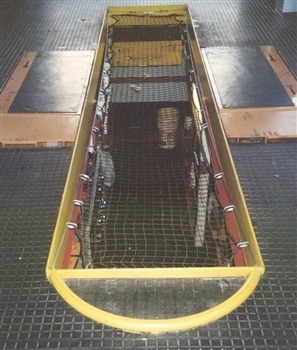 Each pit net opens by sliding the net on a galvanized steel cable installed along the open pit sidewalls. 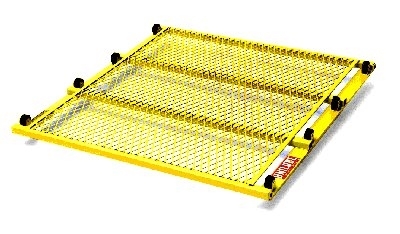 A typical pit safety net takes only minutes to open end-to-end. Meets OSHA Requirements for Open Pits. Meets Insurance and Local Government Safety Regulations. Pit GuardTM is Built to Withstand Weights in Excess of One Ton. Can Be Installed with Regular Angle Iron. Our Combination Track, which is welded to the pit wall, serves Triple Duty as Tire Guide, Pit GuardTM Track and Rolling Drain Pan Track. Pit Bull Safety Cover has been designed with safety, low cost and ease of mind. When used, it is not only convenient but reliable during daily operation. Pit bull allows many added benefits including simple care and minimum maintenance.